Includes one 1960's style prom flip wig. Available in auburn, black, brown, or strawberry blonde. The wig features an elastic band on the inside for comfortable one size fits most sizing. 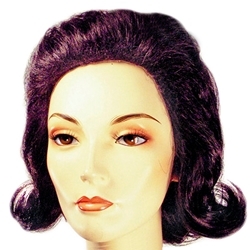 The 1960's prom flip wig can be used for a number of different characters from the 1950's and the 1960's. Some suggestions include black for Lucy from You're a Good Man Charlie Brown in black, or for the show Hairspray.